ANN ARBOR—The approaching monsoon season could bring a high risk of more landslides in quake-ravaged Nepal, say scientists who are using stunning footage shot by drones to map regions hit by rockslides. A year ago, a 7.8-magnitude quake jolted central Nepal, killing more than 8,000 people. Two weeks later, a 7.2-magnitude aftershock rocked the region in the Himalayas. Both events triggered widespread landslides. During the past year, a team from the University of Michigan has used drones to map 22,000 landslides caused by the earthquakes. The dramatic aerial footage shows lush mountainsides scarred by streaks of rock and debris that tumbled down the steep slopes. Car-sized boulders were sent crashing into riverbeds, where they threatened to create landslide dams that could cause hazardous flooding. “While last year’s monsoon was relatively mild, concern is high over what to expect this summer, if we were to have a normal or stronger-than-typical monsoon,” said Marin Clark, a geomorphologist and geophysicist who was part of the U-M team. “We’re releasing this new landslide inventory in time for the upcoming monsoon season so that government officials and aid organizations can use it to help a country that’s still recovering from last year’s disaster,” added Clark, who studies tectonic movements in the Himalayas and is an expert on landslides triggered by earthquakes. Hillsides stripped of vegetation by landslides become hotspots for further landsliding during summer monsoon rainstorms, said Clark, an associate professor in the U-M Department of Earth and Environmental Sciences. With funding from the National Science Foundation, Clark and her colleagues have been studying where and why the landslides occurred. 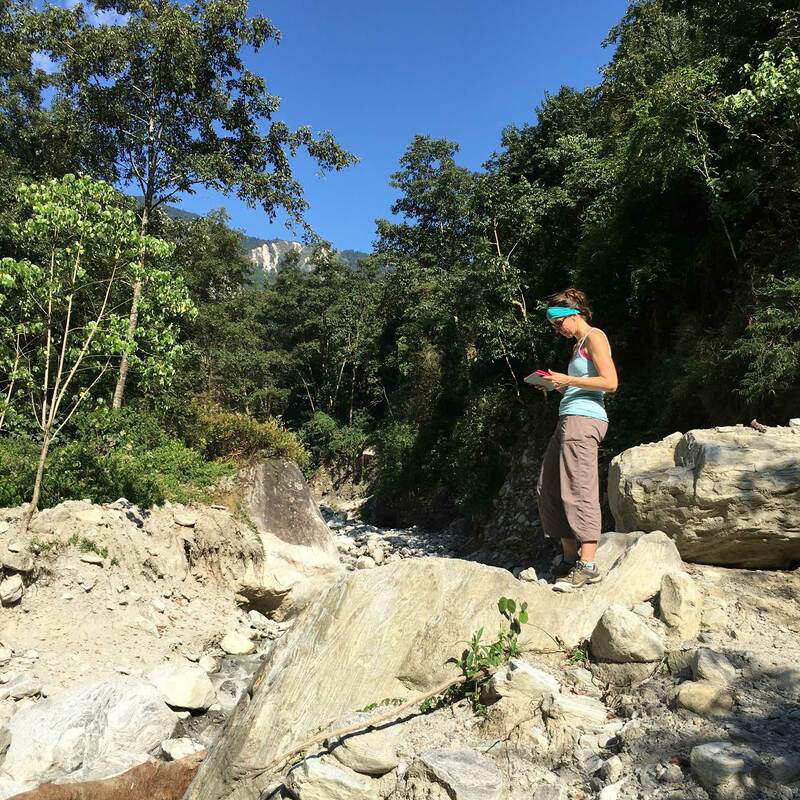 Marin Clark assessing boulders deposited during a monsoon-triggered debris flow near Timbu, Nepal. Image (Credit: Dimitrios Zekkos). Clark’s collaborators include Dimitrios Zekkos of the U-M College of Engineering and Joshua West of the University of Southern California. U-M graduate students Julie Bateman and Will Greenwood participated in the fall fieldwork, and undergraduate student Kevin Roback developed the digital landslide inventory. During the 2015 field season, the researchers also documented evidence of monsoon-related debris flows resulting from earthquake landslides. Debris flows are fast-moving mixtures of water, soil and rock. After Nepal’s earthquakes, debris flows impacted villages and temporarily blocked rivers, creating a flood risk.